The holidays are quickly approaching, and perhaps ever since summer ended, you've had those nagging thoughts in the back of your mind that it's time to get going on those home renovations. You're dying to spend this holiday season entertaining in style. If that sounds like you, you've come to the right place. Sprucing up your space can be done before your relatives and friends start arriving for party after party. If you're looking for a professional Denver kitchen renovation, rest assured that we can take care of all of your renovation needs. Nothing breathes new life into a kitchen than brand new counter tops. If you're planning on incorporating a new kitchen renovation into your home remodeling plans, new counter tops are a great place to start your planning. What types of designs interest you the most? In fact, consider your dream kitchen. What better time to make it happen for your home than right now, just in time for the holidays? A granite counter top might be a part of your desires. Or perhaps you'd like to add a Corian counter top. Be sure to evaluate all of your options (and there are many!) to get the one that's right for you and your home. Nothing says "Happy Holidays!" like a gorgeous new floor. However, many people are having the same thought as you are this time of year. So, if you have a new floor on your list of things you'd love to see as a part of your Denver kitchen renovation, it's best to act fast so you're sure to get the style you want, and see it done in time for those fast approaching holidays. Once you've come up with all of your ideas for what you'd love to see happen during your kitchen renovation, you'll want to consider adding new lighting. Great lighting is an important and elegant way to highlight all of the changes you've made. Just imagine the look on your caterer's face when she is able to work in a brand new, freshly renovated kitchen! You'll want to show off your new lights for every holiday this year, topping it off of course, with a beautiful New Year's Eve party. With lighting that can be adjusted to fit the mood of your celebrations, your party will be a huge hit among all of your friends. If you had to identify the epicenter of your household based on how often you use certain living spaces, what room(s) would you pick? Two locations come to mind right off the bat: the kitchen and bathroom. After all, these are the usual hubs of family activity in your everyday life. These shared spaces are gathering places where busy lives intersect, interact, and establish routine. But have you ever stopped to wonder how well these rooms function? Whether this question has already prompted you to draft a wish list of home improvements, or you are considering tackling an improvement project for the first time, remodeling your house in Denver may be just what the builder ordered. Aspen Builders work with each client individually. Any Denver house remodeling project related to bathrooms or kitchens is fully customized to fit the needs of the intended client. There is a renovation style to fit families of all shapes and sizes. Your kitchen and bathroom may serve different functions within the household, but they have something in common - the need for individual comfort within a shared space. Comfort and functionality go hand in hand; they just mean different things to different people. A kitchen with additional integrated storage and unique space-saving ideas like under the counter appliances. Dining room includes well-spaced seating areas utilized for counter space, table area, and corner nooks to double as after-school study areas. Kitchen has an open universal design that makes sharing the space easy and allows everyone to interact with each other. Bathroom area has extra sinks and vanities so everyone has their own “station” to use. Second bathroom added so children and adults have separate spaces. Stone, tile, fixtures, custom shelving/benches, and mosaic accents give the bath area a personalized look. And that’s just a taste of what Aspen Builders can do! Their talented craftsmen and technicians work tirelessly to see that your expectations are met. Each project is assigned to an Operations Manager who stays on site from start to finish. This commitment to teamwork and customer satisfaction keeps your Denver house remodeling process organized and running efficiently. Take the first step toward the kitchen and/or bathroom of your dreams. Schedule your free inital in-home consultation today! Aspen Builders' professionalism and expertise will insure you get the stylish space utilization you've been looking for. Visit the company’s website www.abcdenver.com for more information and remodeling inspiration! Fall is just around the corner, and for a lot of guys out there, this changing of the seasons marks the beginning of another one altogether: football season. Everyone knows that there are certain staples and traditions that go along with this Sunday afternoon ritual. Some of you tailgate, some of you fire up the grill all season long, and some of you host events for your entire Fantasy Football League. Whatever your ideal game day environment looks like, there’s one thing you shouldn’t spend another season without - your very own man cave. It starts with imagining the possibility of having a personal retreat to escape to. As you build the space in your mind a theme begins to present itself. It may have started with football, but it doesn’t stop there. Yes, there’s home theater projection with built-in media storage and enough seating for all of your football buddies. What about the rest of the space? All of these possibilities converge and develop into a frenzied description you will subject your family and friends to on multiple occasions. Then something happens to derail the “what if” train. It could be you, talking yourself out of it. It could be your friends and family telling you to be more realistic. It could be the cost of the remodel or simply finding the space that fits your man cave. Whatever it is, we’ve all witnessed this cycle at one point or another, but there is a way to break it. The answer to your man cave prayers is a Denver basement remodel. Before you dismiss the idea of owning the man cave you’ve been dreaming of, yet again, consider taking a different approach. A Denver basement remodel is the perfect rebuttal to all of the doubts that are keeping you from making this dream a reality. Think about it for a second. Luckily, Aspen Builders uses all of this and more to complete your bathroom, kitchen, or basement remodel. Their reliable and experienced builders serve the greater Denver area. From the craftsmen and technicians to the Operations Manager; everyone involved in the project is dedicated to seeing your dream become a reality. 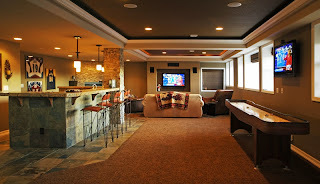 So contact Aspen Builders at: www.abcdenver.com and schedule your free in-home Denver basement remodel design consultation today! There's still time to get your man cave completed for this upcoming season! Keeping the beauty of your home is the dream of every homeowner. This means that the remodeling should be eco-friendly and done at the right time. Although renovation of your home will depend on your readiness, experts in Denver house remodeling will inform you that improving the general look of your home should be done during summer or fall because during this time, children are preparing to go back to school, thus the contractor could do its work without much interference. Secondly, with the warmer weather, the house occupants and contractor would not be affected by the extreme cold weather that characterizes the winter season. Your bathroom is a very important part of the house and should be refaced with bathtubs and acrylic when the old ones are destroyed. For your bathroom to remain spectacular, fitting attractive custom overlay and replacing the bathtubs could keep it fresh and economical. Our home remodeling experts in the Denver area will give you appropriate advice on how to customize a bathroom without breaking the bank! The basement of your house shouldn't be overlooked, as this area adds great value to any home, especially when it's an attractive and inviting space. Therefore, when you are thinking about remodeling, you should consider the basement a priority to maintain the beauty of your home. We'll give you advice on layout and recommend what materials to use for its total finishing. Basement remodeling is very important and can becostly due to a variety of issues. There are different types of basement renovations; you may decide to use sophisticated designs or clean, simple lines depending on your financial capability. Either way, we'll take into consideration the fixed objects in your space and design and implement accordingly. When thinking of house remodeling in the greater Denver area, it's important to choose a reliable and experienced builder such as Aspen because the company has adequate experience in creating unique designs for all different types of homes. We'll help you make the tough decisions, as we know an undertaking like a home remodel can be a once-in-a-lifetime opportunity! Are you thinking of remodeling your home? Would you like a larger bedroom, a fun play room, or a man cave all your own? Or, maybe you wish you had a room to rent out? Before building on an entirely new room, take a look in your basement. You no longer have to use that room as a dumping ground for everything you don't want in the rest of your house. Now, it can be a warm and inviting living space, and it doesn't have to be a cookie cut out of everyone else's design. For example, along with a coat of paint, and a dropped ceiling, you could add a bathroom, and a home entertainment center, which would spice up any living space. Two things to remember when remodeling your Denver basement is to think about appropriate flooring, and hiding any pipes or wires that may be exposed. Why stop at the possibility of a man cave? Why not think of your basement as a school away from school, or a play room that will bring all the neighborhood kids over. What better way to keep your kids close to home, than to bring in their friends with Foosball, white board or chalk board walls, rubber flooring, a water table, and circus themed lighting? Oh, the homeschooling possibilities are endless, with a denver basement remodel. Or, here's an idea that light sleepers will love: Don't just build yourself an excellent master bedroom, build a bedroom oasis: an escape from the rest of the world. Now, you can have a spacious, bright bedroom, with a walk-in closet, plush carpeted flooring, windows to bring in soft lighting. Why not add a sound system, and soft wall colors. With a nature sounds CD, you'll have your own hotel and spa. My personal favorite option, for a larger basement, is the idea of building in a studio apartment. An open floor plan will keep the space from feeling cramped and dark. Add in a counter, small stove, refrigerator, and a sink, on top of a bathroom and closet, and you've got your self a very sweet living space. It could be divided up into a living and dining area, as well as a bedroom. You can take that old stair case, build in a seperate entrance, and you've got a great area you could offer to house guests, or even rent out. The options are endless when considering a home remodel, basement or otherwise, in the greater Denver area. There you have it, four great opportunities for remodeling your house. A man cave, for the man who loves his home theater; an exciting play room, a bedroom for the woman who has everything, and a studio apartment for your college student or a tenant. What more could a home owner ask for? Home remodeling is something that has become as common as going on a vacation. Everywhere you look there are magazines, books, and websites; there are even television channels dedicated to the trade. The task of remodeling a home is one that can be either very complex or painstakingly simple, if the correct steps are taken. Below is a list of steps to take to insure your new home remodel goes off without a hitch. The first step to take when planning a remodel is to consider the basic layout of your current home. Making your home look better is the basic premise of a remodel. However, look and functionality is often a better way to look at it. Hiring a designer that is versed in every aspect of a build, and who gets as excited about the remodel as you do, is crucial. Given that you are paying the team of builders and designers, the job must be done to your liking, and it also must be done right. Second thing to consider while remodeling your home is project implementation. You may have an idea or design in mind, but ultimately you’re not an expert. Review your design and ideas with your team and be open to suggestions. There may be an idea that could fit better, or possibly one that you have may simply not work due to the design of the house. Also, while going over the plans with the building team, ask if there are ways to make the build less expensive. Either buy what you need up front or buy only what you need as the project goes along. This way of budgeting will make sure you don’t out-spend your bank account. Making sure that the construction is on schedule and going smoothly may require you to have meetings with various people involved in the build. Don’t be afraid to take the time to meet individually and discuss goals, visions, or any complaints you may have about the way things are coming along. Home remodeling is a huge investment and not one that should be taken lightly, so pay attention to the smallest of details. Lastly, making sure that your home is ready to be remodeled before the crew shows up will not only insure that the job will be done on time, but will also give you peace of mind that nothing in your home will be damaged. Supplying things such as a temporary bathroom and kitchen area for the crew to use and making trash bins easily accessible will make sure your property remains clean. Ample storage room and an area for supplies to be delivered will give you peace of mind that all your hard-earned money will not be wasted. Where do you find your Inspiration for Denver Home Remodeling? In a world that never stops changing, it would be crazy to think that our tastes in the way we decorate our homes would be any different. So what, if anything, gives you inspiration to remodel your home? Many people do what they can to keep up with current trends and latest developments; this alone can be stressful. However, how many of us truly find real inspiration that isn’t found within a trend, to spark imagination? Sure there are magazines, books and even websites that can give examples and endless amounts of information, but many lack true imagination. Below is a list of ways where you can find inspiration that will set your new Denver home-remodeling project apart from the rest. Another helpful tip on gaining inspiration would be to attend open houses in an area that you find particularly attractive. Many times model homes are used for open houses, and they are generally outfitted with the latest and greatest gadgets, as well as decorated and finished to pristine quality. Going to one of these types of events will often give life to a two dimensional version of something similar that you had in mind. Like with any remodel, it is important to remember that this is your home and not belonging to the person doing the build. Have an idea in mind and incorporate things into it that make it special. Many times ideas start out one way and end completely different. Designing your home in a way that is meaningful and special will create warmth that could never be put there artificially. Ultimately, inspiration has to be sought out; it’s not something that generally falls into your lap. So go out and explore and bring what you find to life! Remodeling the basement of your home can often times be a daunting task. More often than not questions like, “What type of flooring do I want” or “What do I actually want to do with this space” are questions that you will ask yourself. For this very reason, the following list of tips and ideas was made to hopefully make your basement remodel go a little easier! • Transform your basement into a family room or game room! o Many times when you have guests over, you end up in one of two places: the kitchen or the basement. For this reason it makes sense to turn your basement into a comfortable, inviting place for friends to relax and enjoy each other’s company. Incorporating additions like comfortable furniture, pool tables and possibly a big screen TV add style, and adding things like wireless internet connections, sound systems and good lighting bring it all together and make it functional. • Add a bed and bathroom to your basement! o This creates a great space for an older child or guest. Make sure the room you create has enough space to be functional and fit all the proper amenities a bedroom should have. o If you have a basement, there is a 99.9% chance you have stairs that help you get there. Turn an old boring staircase into one that has beauty and functionality. Take into consideration however who lives in the home and who will be using them most often. After all, you wouldn’t want an open staircase design if there are small children or pets that are a concern as they could fall through. o Many times basements are built by poured concrete or stack concrete blocks. If you spend enough time in the basement, this is something that isn’t necessarily appealing to the eye. Style your basement like you would any other main floor of the house by adding drywall, paneling and plywood or simply paint over the exposed concrete. • Do something with the ceilings! o There are really only a few options when it comes to finishing the ceilings of your basement. However, these changes that are available can turn a dark, cold basement into something that would be mistaken for the main floor. Something like concealing the joists, ductwork and exposed pipes along with adding wood paneling or even dropping the ceiling can do wonders to the look of a basement. As you can see by the list above, there are many doable options when it comes to a basement remodel. Choosing a professional to assist you on these tasks is always recommended. Next time you’re in the market for a new basement, think Aspen builders, the premier choice for basement remodels. What Colors are in your Next Home Remodel's Future? Every year color trends change and some carry over from the previous years before. One thing that doesn’t change year to year however is the way certain colors make us feel. Taking these colors into consideration when remodeling or simply changing up your color scheme can be very important. Colors such as red, blue, green, peach and coral paired with certain shades of yellow can create a very energized space and are hot trendy colors for 2012. Neutral colors such as grey are also becoming popular and its neutral color in many ways grounds a room and leaves many options to add bright colors to really bring the room alive. Below is a list of color options based on rooms that are sure to bring out the personality in your home for 2012! • Kitchens - Colors such as tangerine yellow either as an accent to grey or all on its own will really make your kitchen bright and inviting. While traditional colors such as brown and white are in style, they will as always remain sophisticated and versatile. • Bathrooms- Go for a calm relaxing color in 2012. Elegant and unpretentious colors such as purplish blues and gray blue are always great options. If plants and flowers are a theme within your space, try to work with natural colors to further continue the trend. • Living rooms- The sophisticated elegance of the 30’s and 40’s are making a comeback in 2012. Vivid unexpected colors such as bright yellow greens and earthy natural tones are comforting as well as versatile and work well with most décor. Colors like apple greens and fuchsias can many times be uplifting and optimistic as well. • Bedrooms- The whole spectrum of monochrome colors are found to not only be in style, but they are also found to be very romantic. Earthy greens and browns are said to bring an earthy natural calm to a room, often enhancing ones restfulness. If a more refreshing sense is what you are looking for, a bright blue and clean white scheme may be in order. With all these ideas in mind, it is important to never stray too far from your own. The colors and themes that make you feel comfortable are ultimately what will make you the happiest. If you are making an attempt to mix your own styles with what is trendy, use your favorite color as an accent or add them in as decoration. Experiment with color combinations that evoke desirable feelings within you and above all have fun doing it. There are many choices out there when choosing a qualified basement remodeling company. When you’re in the market for a basement remodel, look no further than Aspen builders, the premier choice in home renovations. If you are in the market for a new Denver basement remodel, or even a complete remodel, why not go green! Sure it may cost a little more up front but the return on investment is worth every penny. In a time where instant gratification is sought after and more often than not preferred. Here is a list of helpful tips to make going green not only easy, but quick and cost effective. • Simply change your lighting. The additions of florescent light bulbs are an easy way to save energy, thus saving you money. Along with being a money saver, fluorescent bulbs save over 2000 times their weight in emitted greenhouse gasses. • Installing durable, sustainable bamboo flooring. Not only is this wood naturally sustainable, but it is also naturally resistant to bacteria and naturally beautiful. Bamboo comes in several different natural colors and resists wear and tear. When choosing your bamboo floor try to choose from those companies that are formaldehyde and glue free in their production, and those that procure their flooring from farms and not the wild. • Swap out those granite and marble countertops with those made from recycled materials. Concrete countertops made from recycled materials are becoming quite popular lately. Not only are they durable but they are very fashionable and can be colored to fit any décor. Recently, such things as patterns, designs and different looks to imitate certain stone such as marble and granite have become available. When properly cared for a concrete countertop can easily last a homeowner 20+ years. • Solar and wind powered energy for your home is a great option if you want to save money on your electric bill. The upfront cost of solar can seem somewhat intimidating at first so check the area where you live to find tax breaks and incentives for using solar power. Generally if the proper steps are taken, your solar system can come at little to no cost to you at the end of the year. • One of the most obvious changes you can make is swapping out your appliances for those that are more energy efficient. Most appliance stores have a section of energy efficient products and come from things like refrigerators to washers and dryers. Most stores offer rebates and discounts for those buying these products and many times you can receive a tax break from your local government. • Tankless or tank free water heaters are a great option if you have a household that uses a high volume of hot water. These products make it possible to have on the spot hot water without running the risk of it going cold. The tankless feature makes it so water is never being stored and heated, wasting precious energy. So as you can see if you are in the market for a green, energy efficient Denver basement remodel there are many cost effective options. Give the friendly pros at Aspen Builders the opportunity to help make a difference in your life. Announcing New Trends in the Colorado House Remodeling Industry! Every year there are new and some say improved trends to the Denver house remodeling scene. 2012 is no different. However, with the state our economy has been in these last few years, folks have been forced to make changes that both make fiscal and social responsibilities. With money tight it has forced people to stay in their existing homes and add items that make them not only feel more comfortable but also give off the impression that they are someplace new. Comfortable style, elegant design and more luxurious materials seems to be the new trend for 2012. People feel more comfortable choosing exotic materials, bright bold color combinations and a new revamped interior rather than purchasing a new home. This is making it possible for those who are comfortable with the home they having and making it more personal, rather than starting from scratch with a new home. Bright earthy tones such as amethyst, sapphire, ruby and emerald are becoming ever popular. Along with golden tones and exotic shades of coral and cream, combined with ivory, browns, silver and warm whites are also taking center stage creating a modern, warm and inviting décor. Also for 2012, light and heavy fabrics are being combined to create interesting contrasts between rooms. Stainless steel and brick are also being utilized to turn cold and warm into something modern and inviting. Doing something many thought in the past to be somewhat of a faux pox, mixing contemporary and modern to be “trendy”. Large mirrors and mirrored tiles are being used to bring more light to a room without the use of actual light, thus not only becoming more energy efficient saving you and your family money but also naturally brightening up a room. To go along with the green trend, wallpaper and paint made from recycled plants materials are creating a more natural and ecofriendly environment. Materials that appear comfortable and warm are popular interior design trends for 2012. Materials such as marble and wood, glass and leather as well as high quality plastics create natural light and beauty and many times gender neutral, creating an inviting and luxurious home space. Items with intricate detail such as wood carvings, crown moldings and ornate lighting fixtures in rich colors create unique and customized looks for your interior as well. Combinations of contemporary, traditional and exotic materials, various styles and colors inspired by African, Asian and Middle Eastern decorating ideals will also offer a warm and instinctual design. Again many times these offer dark and warm colors, bright yellows and deep shades of precious and semi-precious stone colors. Most of all, through all of the trends and style, it is important to make your home an expression of you. Take what makes you happy and joyful and express it through your imagination. Aspen Builders is fully committed to expressing your individuality through your home. Make them the go to people in Denver house remodeling. Does Interior Design play a part in a Remodel? Interior Design and Denver House Remodeling seem like they would play hand in hand, yet could these two categories both focusing on design really have nothing to do with each other? In order to best answer this question, it is important to first distinguish interior design from Denver House Remodeling. From here the two can be differentiated, and the question can be given an honest answer. Interior design is the art or process of designing the interior decoration of a room or building. From this definition, it appears interior design focuses predominantly on the decoration of a room or building after it has been remodeled. It was Ellen Mazur Thomson who actually declared interior design a relevant and needed concept in modern day America; he even created the guideline by which interior design became a profession. He emphasized the importance of education, one’s own high-standards, and professional gate-keeping. With these insights into the design world, an individual could then truly call themselves an Interior Designer. Interior Design as described by today’s standards is the practice of utilizing space in the most effective manner to suit that space’s purpose best. Of the most influencing styles of interior design, Art Deco takes the pick as it avoided traditional décor in substitute for a greater emphasis placed on geometric shapes and metallic colors. Denver House Remodeling can be defined as the process of improving a space. A remodel could include a process as simple as the breakdown of a wall or the creation of a window to a process as complex as the addition of a new room to the elimination of a whole room. Remodeling is about improvement, and of course improvement is a rather subjective topic. After delving into what both interior design and Denver House Remodeling are, it is now possible to more closely examine what role each plays in regards to each other. Before the design of a remodel takes place, it is necessary to define and imagine the interior space. It is important to plan a remodel with the end look in sight. It would not make sense to just build without a plan. In this aspect, interior design and the end look of a space plays a large role in the design of a remodel. The remodel itself can be associated with building the framework or foundation to an idea, while the Interior Design creates the look and feel. It is clear that both interior design and basement remodeling influence each other to a great degree. Without the end result and the desired placement of furniture and wall paint, there would be little to work off of when trying to create the designs for a remodel. Likewise, in order to achieve a certain overall look, the foundational attributes from Denver House Remodeling designs is necessary. People are naturally aesthetic and relate to the overall look associated with remodels. Remember to incorporate both your personal interior design ideas into the overall design and implementation of your Denver House Remodeling. No matter what you are remodeling, whether your Denver Basement Remodel or a kitchen or bathroom, the first aspect to look at would be the hidden parts in a remodel. This would include putting in new wiring that requires getting behind the walls. It only makes sense that you would want to take care of that before you put up new paneling etc. Also, any plumbing that needs to be done should be done towards the beginning of your remodel because plumbing can be messy. You certainly don’t want to be putting in a new tub or toilet after you have just put in a new tile floor. For specifics of a kitchen remodel it would be a good idea to start with the aspect of the room that dominates the appearance of the room. For example, if you are replacing the counter tops and cabinets, this would mean that you should decide on the material and the color that you want the room to contain. The floor and walls are also a dominant feature in this remodel, so color can be a deciding factor. Some parts of your remodel will need to be pre ordered, so you have to make sure to plan ahead. Cabinets are an example of something that needs to be pre ordered. They can also be the most expensive and permanent purchase in your remodel. The cabinets have to go in first before any counter tops or appliances. The floor choice can be determined based on anything from décor to maintenance issues. The material you pick for your floor should be something you want to have around for a while because it is also expensive. This material should also be of a type that you have the time to maintain. The last aspect would be your flooring to help protect the new floor from any demolition involved in the rest of the remodel. This would apply in any remodel including your Denver Basement Remodel. If you have to replace a window, this should be done before you replace the cabinets or counter tops. So you can see that the order depends on what you plan to remodel with the idea in mind that you want to minimize the wear and tear to new parts while you are remodeling other parts. It is fair to say that if you are replacing appliances they should be the very last aspect to be brought into the remodel. Matching the color or style to your overall vision for your Denver Basement remodel could mean that you have to plan ahead for a special order. Style versus Functionality: Which takes Precedence in your Home Remodel? Your Denver Home Remodeling project will revolve around your needs and purpose for the remodel. Aspen Builders will help you to prioritize your needs for your home remodeling project. The need may be one of updating the décor and structure of your home. In that case, style will be your primary purpose. Suppose you have moved into an old home that still has 70’s décor (Yes, they still exist.) You know the bright orange or pea green linoleum that should only be part of a movie set now, or the kitchen cabinets that are old and outdated. Again, style will be your primary purpose, and Aspen Builders has available all of the latest styles and updated structures to choose from for your project. However, if you need your Denver Home Remodeling project to make your home more useful, then functionality will be the primary focus of the project. But even in this scenario style is a secondary focus. You live in your home with the purpose of using your space for your specific lifestyle, so your home should reflect the uses you have. Your Denver Home Remodeling project may be because your family is growing, and you need more space. Or your project may be due to an elderly family member moving into your home. In either case, the remodel will focus on making your home more functional and user friendly. An example of the latter case might be to update a kitchen for your elderly parent’s use. Maybe there are low cabinets that will be difficult for your family member to bend over to get into. New cabinets that just slide out will help to solve this problem. Another example might be if your home doesn’t have enough room for a washer and dryer. In addition, suppose your home doesn’t have many kitchen cabinets. One solution could be to design new cabinets for more storage in the kitchen, which might alleviate the need for the pantry. Then the pantry could be turned into a nice laundry room for a stackable washer and dryer set. Aspen Builders can take into consideration all of these needs and come up with solutions that could apply to many universal situations to cut down on the need to remodel every time there is a change in your family. So unless you are a design technician entering a contest where style is the main element, when you are considering your Denver Home Remodeling project, functionality is like the rudder on a ship to guide your plans. Aspen Builders is the place to go for the knowledge about all those functional needs and the latest styles too, because with your Denver Home Remodeling project, style never has to be sacrificed just for functionality. Aspen Builders can give you both. So you want more space? A DenverBasement Remodel will certainly solve that problem. Every basement remodel is different depending on the features you want to include in your plan. An example of a great Denver Basement Remodel. The average cost for a basement remodel is approximately $51,000. That includes just the basic walls, flooring, and lighting with the ceiling. Twenty to thirty percent of your cost of this Denver Basement remodel will be for the actual finished product. The other seventy to seventy-five percent goes to labor and expenses. Expenses include things like permits. The first thing you should consider in this basement remodel is whether there needs to be any waterproofing treatment. Basements are dark and not ventilated well which can breed moisture buildup and mold, all of which needs to be taken care of before the rest of the project continues. Plumbing is the next cost to be considered in terms of additions to the basic remodel. 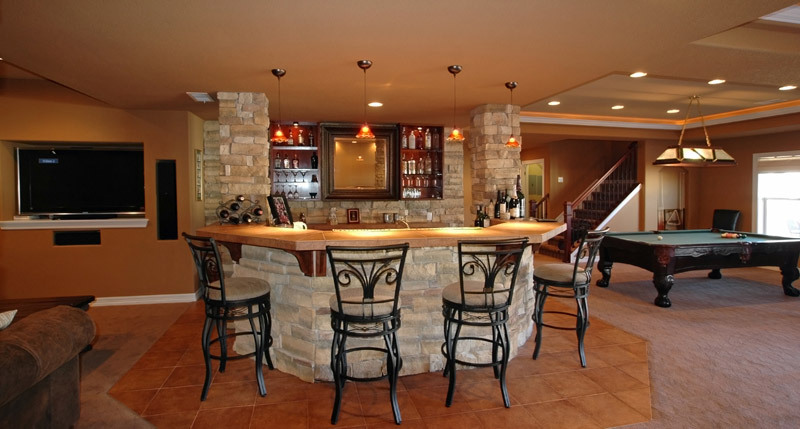 Adding a wet bar, bathroom, or kitchen can be the most expensive part of a Denver Basement Remodel. The cost for a wet bar or bathroom can add anywhere from $20,0000 to $61,000 to the basic cost. This cost is if the basic roughed in plumbing is already present. Even if the plumbing is already roughed in, many times an additional main waste line and vent line need to be added anyway. The final element in your basement remodel is the electrical and flooring choices. Electrical wiring depends on what electrical features are needed, which could include anything from a home theater and hot tub to an additional washer/dryer outlet. If a new electrical panel is needed that can run anywhere from $2,000 to $35,000. Flooring can be anything from laminate flooring to concrete floor staining. As mentioned earlier, over seventy percent of the total cost of a Denver Basement Remodel entails the labor and expense costs, but it is easy to see that many of the problems and features that may turn up in your remodel will require the skills of a professional technician. Unless you possess those specialized skills, you will need to hire professional help even if you are doing a do it yourself project. Finding all the various professionals and hiring them on your own can be very expensive, time consuming, and stressful to say the least. Aspen Builders can take you through the entire process from professional plans to the final construction piece. Aspen Builders has all the professionals needed for any of your choices under their one roof. With Aspen Builders, the first day of construction will begin with a firm fixed cost based on your detailed design. One of the best and easiest ways to add value to your home is to remodel your basement. Not only does this instantly increase value, but a Denver basement remodel can provide extra living space that otherwise may go unused. For the best Denver basement remodel possible, consider the below tips. 1. Clutter Reduction. Most basements consist of dark areas where items are stored such as extra furniture, decorations, food and supplies, old toys, sporting equipment and other things not regularly used. Using the basement to store rarely used items can be wasteful and encourage holding onto things unnecessarily, creating clutter. Before starting any Denver basement remodel, clear away items no longer needed to best envision how the space will be used. 2. Denver Basement Remodel Plan. Consider how you can best use the space. For example, there may be a need for an extra room to afford more privacy to a family member or for a specific person or a guest room for visitors. It may also be beneficial to use the space for certain activities for which a basement’s characteristics will offer natural advantages. For example, the lack of light could be useful for creating a dark room for photography and a studio or home theater. The isolation can also assist with creating a sound barrier for play areas, teenager hangouts or a studio to practice musical instruments or create music. In addition, the basement environment provides easy access to heating ducts, water lines, electricity and cooling ducts. Because of this adding a bathroom is much easier than it might be at another location within the house. 3. Basement Designs. Remember that the goal of a Denver basement remodel is to maximize the space. To do this most effectively, aligning with a professional company like Aspen Builders can provide you with technical details that can greatly affect the success of the project. An interior designer or architect can also assist in getting the most out of the existing space. With careful planning, you can make your goal of having a more useful, comfortable and attractive basement possible. 4. Water Issues. Whether the basement has had flooding or dampness issues in the past or not, it is essential to confirm that any issues are resolved completely, prior to the start of any Denver basement remodel. A finished basement will only be as successful as the preparation and design, as well as the execution and quality of the work involved. Understand that permanent solutions may take more time than anticipated to implement. This is because sometimes, as work begins, issues that were not realized prior may surface. Therefore, it is good to hire an inspector specializing in foundation or basement waterproofing, such as the professionals at Aspen Builders. Contact Aspen Builders, send an e-mail to sales@abcdenver.com or call (303) 471-4355 to find out more about how we can assist with your Denver basement remodel for the best results, in the most efficient and cost-effective way possible. One striking feature of the Denver, Colorado area is all the beautiful, old homes. Miles and miles of Craftsman and brick homes dot tree-lined streets. This is part of what makes Denver so distinctive and special. However, one problem with these homes is that they eventually become outdated, losing not only functionality but some of their beauty as well. If your home needs some updating to return to its former glory, consider hiring a Denver home remodeler. One of the ways a Denver home remodeler can help bring back the beauty of your Denver home is by understanding the particular challenges that living in Colorado can bring. Our dry air can affect wood furniture, edging, decks and other surfaces, which is something that not all contractors from other areas of the country might understand. Talk to the Aspen Builder experts at ABC Denver to find out how you can restore the beauty of the wood in your home, making it shine the way that it once did. Over time, all homes fall into some form of disrepair, even those maintained over time by homeowners. One reason for this is that not even the most talented do-it-yourselfer will know all the areas of a Denver home that need to be monitored, repaired or updated over time, such as the foundation, the plumbing, electrical system or other areas of damage. A Denver home remodeler can identify the areas of the home that need addressing and repair in order to bring the house back to true function, safety and beauty. Take a walk around Denver streets and you will see interesting, charismatic and lovely homes of all kinds, shapes and styles. Many of these homes are over a hundred years old and have amazing historical details, sometimes tiny and sometimes all encompassing. A home remodeler who understands the Denver area history and how to preserve the historical detail of Denver homes can help bring a home up-to-date without losing any of the historical interest or significance. Older homes are many things, but energy efficient is rarely one of them. While newer homes have energy efficient windows, insulation, roofing, plumbing and appliances, most old homes do not. These homes are often costing their owners extra money in heating and energy costs every year. Contact a home remodeler such as Aspen Builder to find out how to update your home and increase energy efficiency, all while keeping the preservation details intact. Unless you are a building contractor, you are probably not familiar with all of the current Denver building codes, which mean that your older home may actually be in violation. A Denver home remodeler can help bring your home back up to code while making improvements, restoring beautiful details and designing your home the way that you want. Call us at Aspen Builders to start your home remodeling project. We look forward to helping your home be beautiful again. Don’t let 2012 pass you by – plan a new beginning, plan your own Denver basement remodel or home remodeling project. The New Year is just starting. It’s the perfect time for something big, meaningful, and rewarding. It’s time to change something in the house for the better. But Wait, Why Remodel the Basement? Why not? In a typical household, the basement is one of the most often neglected and forgotten parts of the home. It’s commonly a sad, moldy place – the stuff of ghost stories and the graveyard of old, unused stuff you don’t want anywhere else. Turning it into something more functional not only adds more financial value to your home, it also provides space for other activities. Why retain a stuffy storage room of things you can do without when you can transform your basement into a games and recreation room, a wine cellar, or even a home theater? One of the most typical New Year’s resolutions is to change something about yourself. It’s much easier to change something about your home, like your basement. All you need is a good plan and a budget. • Need repairs? Plumbing and electrical work might be required before remodeling can proceed.• Want fancy stuff? Tailored cabinetry and fancy options require a larger budget.• Got a full work room? If not, you may need to spend for tools and materials.• Have some cash handy? Always consider where you get your financing from. There are a bunch of other considerations, but in general, the above are some of the most significant points. • Basement ceiling – how your basement’s ceiling is built affects noise reduction, temperature, and even mold build-up and prevention.• Lighting – as the basement is not the most well lit part of the house, letting natural light in can be a challenging task. Planning lighting fixtures also need to go hand in hand with your overall remodeling intentions.• Décor – again, an aspect that goes with the entire motif or goal of the remodeling. Remember that you should budget for the whole shebang – not just part of it. Now that you got an initial plan with all your needs and wants factored in, you can then consult with professional contractors about what you want to happen. You can get quotes, plan improvements, and valuable suggestions from the right contractor. You know what you want for your Denver basement remodel project. They know how to make it happen.